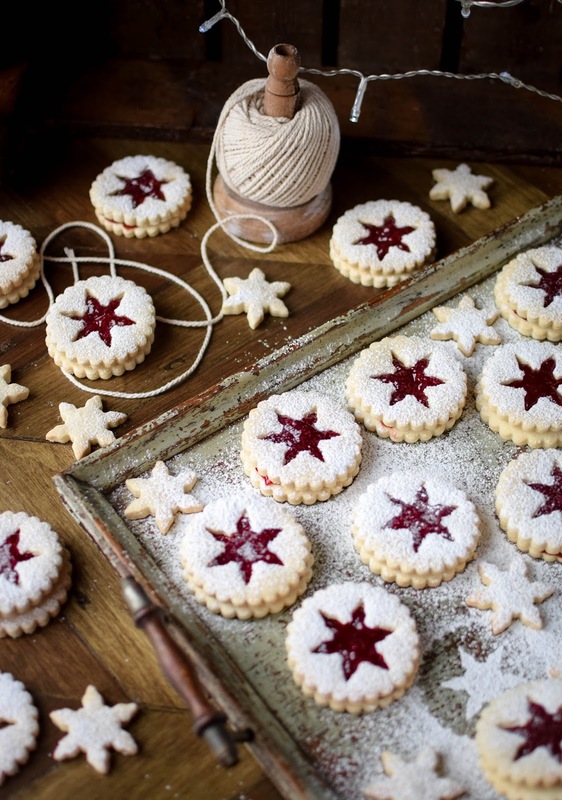 Linzer cookies are one of my absolute favourite cookies to make around the festive season. Not only are they quick and easy, they always look so beautiful. Like delicate little works of art, worthy of any artisan baker’s window display. It’s all down to that light dusting of icing sugar right at the end, like little snow flecked ornaments, too pretty to eat. Whoever would have guessed you can knock them up in under an hour. 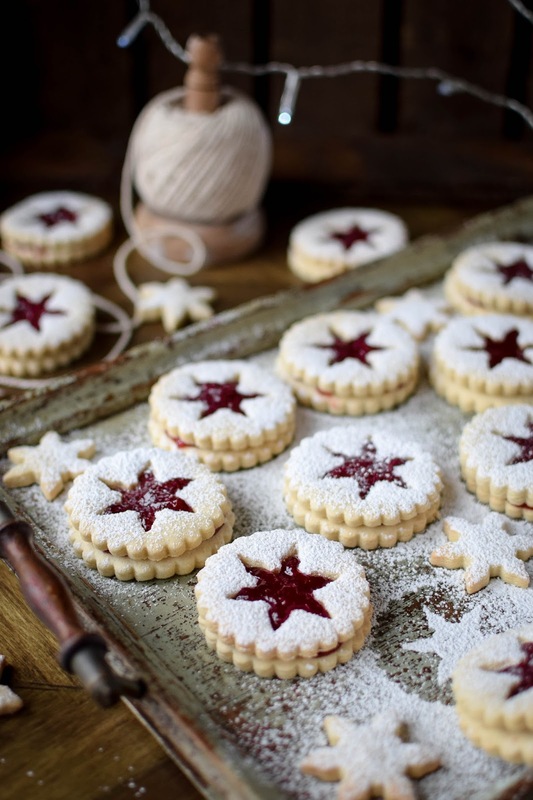 You can use any jam you like in Linzer cookies, I like strawberry as it’s traditional, but I think they would be delicious with any fruity flavours you have in your cupboard. I’m desperate to make some with some home-made cherry and amaretto jam, you just know that sounds delicious. These cookies also make the most darling holiday gifts, all stacked up in little cellophane bags tied beautifully with some festive ribbon. Who wouldn’t be thrilled by such a lovely, handmade present? 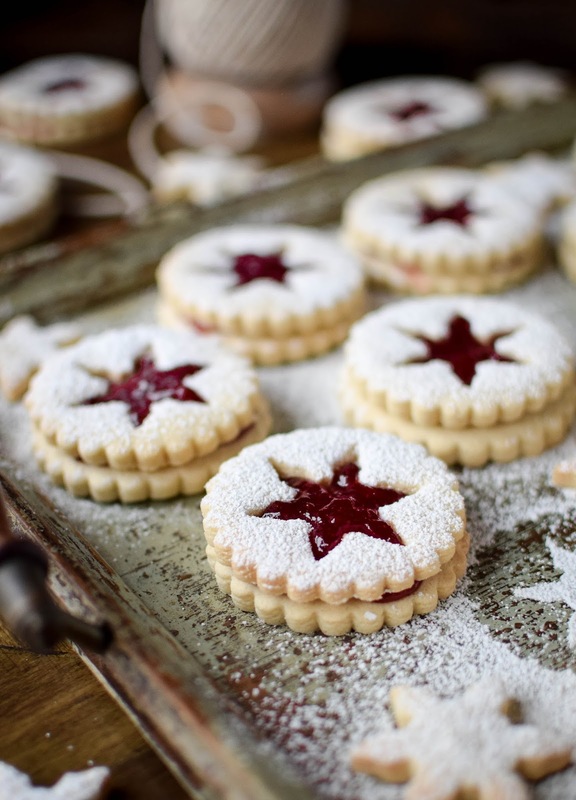 Plus if you’re lucky, the recipient may even invite you in for a cuppa and a Linzer. Win-win. I like to customise the little jammy windows to the occasion I’m baking for. I used delicate little snowflakes here but I’m also partial to a wee heart or star. You can go as wild as you like, fancy a little cat shaped window? Go for it, you do you! 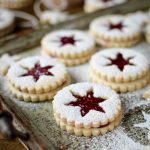 Linzer cookies are one of my absolute favourite cookies to make around the festive season. Not only are they quick and easy, they always look so beautiful. Preheat the oven to 175C and line two large baking sheets with baking parchment. Place the butter and sugar in the bowl of an electric stand mixer. Beat together on medium-low speed until smooth and fluffy. Add the eggs, one at a time, scraping down the sides of the bowl with a silicone spatula after each addition. Stir in the vanilla, salt, and cornstarch. Add the flour, a little at a time, mixing on medium-low speed after each addition. to cut little windows in half of the cookies. Transfer to the prepared baking sheets and bake for 12 minutes or until barely coloured. Cool completely. Spread a tablespoon of strawberry jam onto the bottom round cookies then top with the windowed cookies. Sift over a tbsp of icing sugar and serve. You can use any jam you like in these cookies. Maybe try Nutella if you’re a chocolate fiend. My grandma always makes these for Christmas! I’m not a fan of jam but she does chocolate version for me haha. Loving this recipe! These are so pretty! I always thought they'd be much more difficult to make. These look so pretty! The red colour of the jam is so effective! I wish I could bake biscuits without burning them! I like your idea of stacking them in cellophane bags for gifts! These cookies look so pretty. I know my kids will want to make some the second they see them. Such utterly beautiful biscuits! I love your snowflake cutter too – adorable! These are so pretty! They remind me of Jammie Dodgers in design. Sure my husband would love some of these! 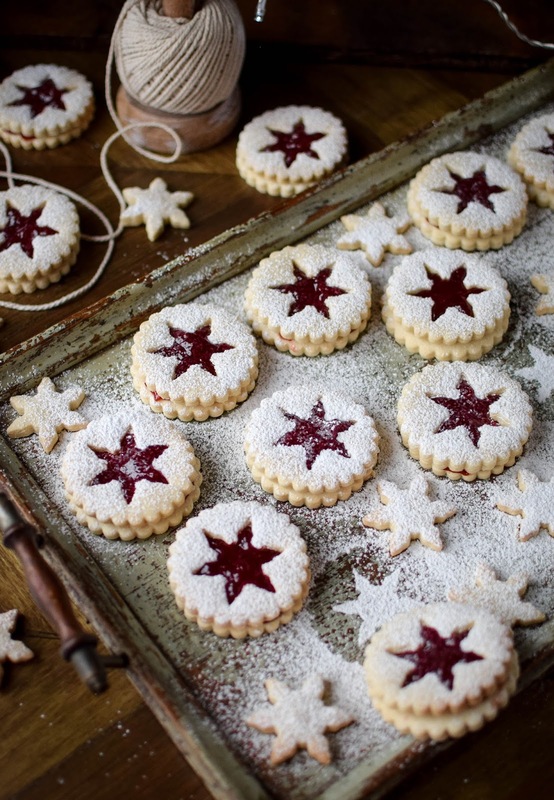 I love Linzer cookies! Can't wait until Advent to bake some. I did these cookies with my daughter for her sixth birthday which was a tea party. It was a lot of work but it was a whole lot of fun as well. These cookies are delicious. Something similar my mother makes for Christmas. I bet they are delicious! Wow, this is really looks a cute cookies and I can't wait to try these before Christmas eve. Amaretto and Cherry jam! Wow! I am in!!!!! Can I pop in and have a cup of tea with some of them? What yummy looking cookies. They look so delicious. They look very beautiful. Next to that, the taste must be amazing, I'm sure! Would love to try one (or a whole lot more).